“Seclusion and restraint” is using physical force, restricting movement, or involuntarily medicating or isolating people to manage their behavior. These methods are often used to control people at risk of harming themselves or others in settings such as juvenile detention centers, psychiatric hospitals, residential treatment facilities and schools. Use of seclusion and restraint is considered a failure in treatment because it can be traumatic and dangerous to consumers and staff. Since 2004, the foundation has hosted conferences, sponsored training for agencies across Texas, and provided educational materials about reducing the use of seclusion and restraint. In 2015, the Hogg Foundation published an evaluation brief summarizing the results of an evaluation of the Reducing Restraint through Trauma-Informed Care for People with Intellectual Disabilities grant program that the foundation launched in 2012. The report, titled Findings from Trauma-Informed Care Training at Two Texas State Supported Living Centers, summarizes the results of the evaluation conducted last year by the Research Division of MHMR of Tarrant County, under the direction of Dr. Kirstin Painter. The evaluation found evidence of a shift in the culture of care at two state-supported living centers that received trauma-informed care training to reduce reliance on seclusion and restraint. 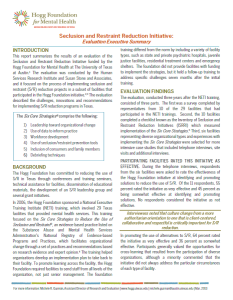 In 2006, the Hogg Foundation sponsored a National Executive Training Institute (NETI) training, which involved 29 Texas facilities that provided mental health services. This training focused on the Six Core Strategies to Reduce the Use of Seclusion and Restraint©, an evidence-based practice listed on the Substance Abuse and Mental Health Services Administration’s National Registry of Evidence-based Programs and Practices, which facilitates organizational change through a set of practices and recommendations based on research evidence and expert opinion. This evaluation executive summary aggregates the results of an evaluation of the 2006 training.